Kirstenbosch Golden Jubilee was celebrated in 1963 with wide publicity and included a country- wide festival, a Golden Jubilee Show at Goodwood and the visit of many botanists from across the world and other events.The image below shows the Director, Prof Brian Rycroft and Curator, Mr Jack Marais commemorating Prof Pearson in 1963. 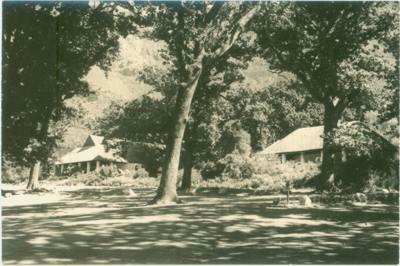 The Kirstenbosch estate was extended by a gift from Mrs Lübbert. 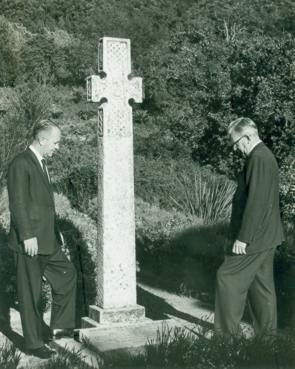 In 1965, Robert Henry Smith who had been on the staff of the Garden since 1917 and was Foreman of the team responsible for most of the rockwork in the garden, died. He had lived in Protea Village and started working at Kirstenbosch at the age of 10. 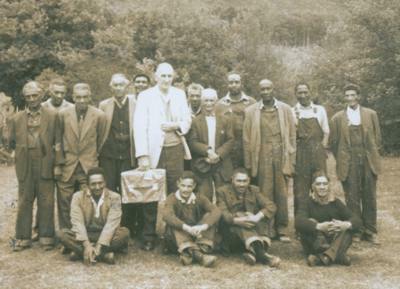 Many members of Kirstenbosch staff lived nearby at Protea Village at that time and it was a bitter blow when they were forced to move to the Cape Flats by the Group Areas Act in the mid 1960s. 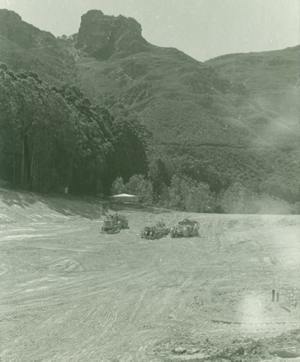 Kirstenbosch acquired two busses to provide transport to work for them. Two long standing members of staff retired in 1967, Mr Middlemost who was assistant curator and Mr Awie Basson. There was not much money for building in this decade, but a guest cottage (where the restaurant currently stands) was built. One of the main developments was the much needed large earth dam (12,000,000 gallons) which was completed in 1969 at a cost of R30,000. However, it soon became apparent that the dam would require a butyl rubber lining that cost more than the dam itself. A large display house was a dream in those years and the curved glass roof of the old Cape Town station was offered to Kirstenbosch to form a large glass house, but the Garden was forced to declined the offer based on conversion costs. 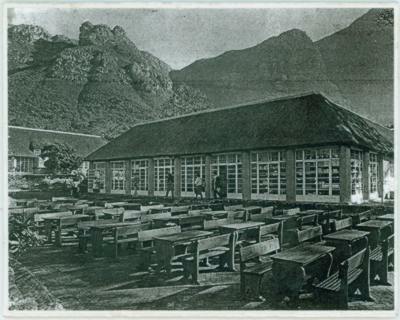 Both the Lecture Hall and the Tea House glassed in their front stoeps in the 1960s and this coupled with the change to the parking area, significantly altered the appearance of this part of Kirstenbosch. The Lecture Hall stoep was glassed in 1966 to provide extra space. Much work was done on laying out the nursery terraces, with propagation units and creating new a car park for the visitors who were no longer seasonal, but flocked to the gardens even on hot summer’s days. Individual admission fees to the garden were first charged on 15 July 1965 and the income for the first year from this source was R7,842. The new entrance lawns complete with the cycads were laid out at the end of the decade. 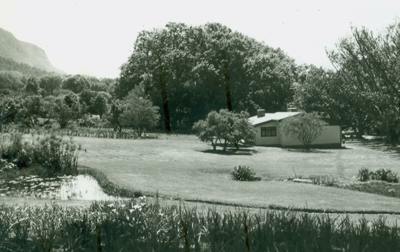 1967 was a watershed year when the National Botanical Gardens were transferred to the Dept of Agricultural Technical Services. Kirstenbosch had about 400,000 visitors that year. A special engraving machine was purchased to make plastic labels for the plants. The Kirstenbosch Scholarship, which funds a student at Kirstenbosch was also established in 1967 by a trust fund left by Mrs Yvonne Parfitt. 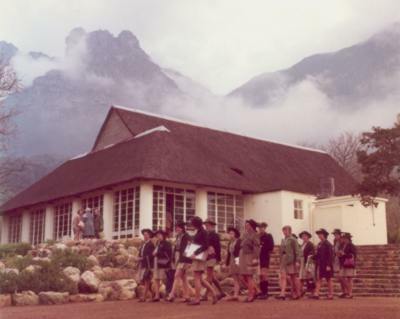 Perhaps some previous Kirstenbosch Scholars could share their images and stories with us?